You need to improve reporting to better understand your business. Automated dashboards deliver a visual representation and immediate access to important KPIs and can show performance trends, so you can act quickly. Unilytics offers a comprehensive 5-day audit and assessment of your data visualization reporting needs and ability to deliver on them. We will work closely with your subject matter experts (SME), technical team (IT), and database administrators (DBA) to define what insight dashboards must deliver, where the data comes from, and how to prepare and load the data in a way that optimizes your data visualization tool. Along the way, we will compare and make recommendations on best tools for data visualization and data management. What’s the best data visualization tool for your use case? 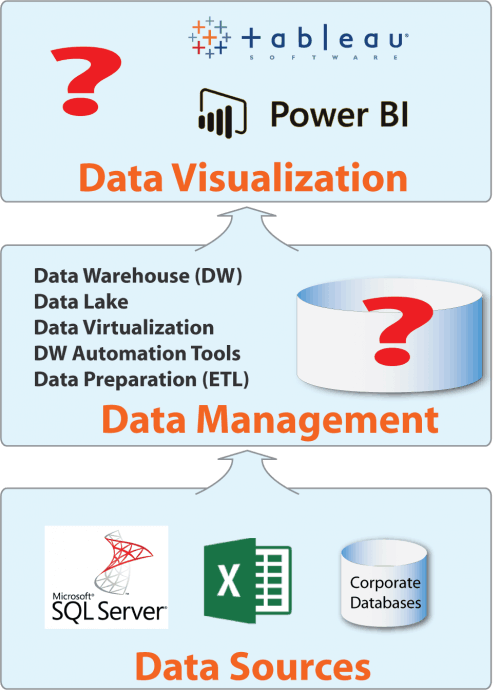 Tableau or Power BI? We use a detailed price matrix calculator to objectively compare costs. But price is not the only factor. We also consider other factors such as ease of use, time to market, functional requirements and licensing options. Unilytics and our subsidiary Altair BI (www.altairbi.com) offer impartial insight to recommend the best solution. What’s your best approach for data preparation (ETL) and a data repository? Do you need to build a data warehouse or data mart? Would you benefit by using a data warehouse automation building tool? What data preparation (ETL) tools are best for you? And are they needed? Does data virtualization make sense?